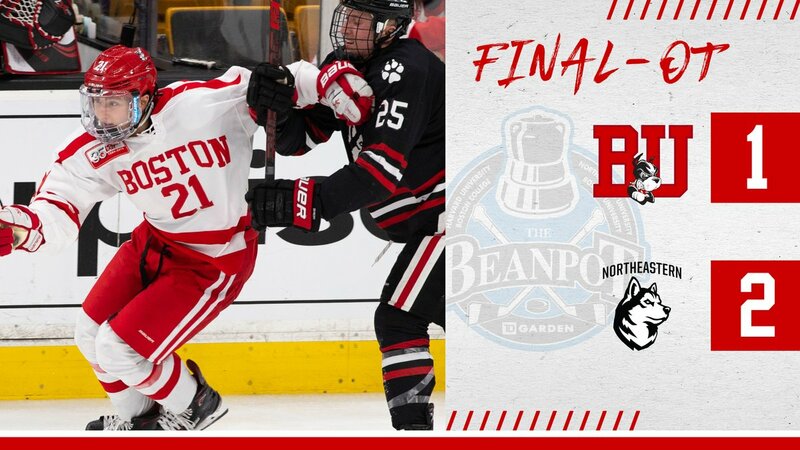 Terriers suffered a heart-breaking 2-1 overtime loss to #13 Northeastern in the Beanpot semifinal at TD Garden Monday night. Goalie Jake Oettinger put on a heroic performance in goal, stopping 47 Husky shots, but the final one—on Tyler Madden’s breakaway 51 seconds into the extra session went off the junior netminder’s arm and skate and into the net. BU’s only goal came of the stick of freshman Joel Farabee. Oettinger also was victimized on Northeastern’s first shot. As Cam Crotty moved the puck from behind the BU net, NU’s Patrick Schule hooked him, turning his body and causing a turnover—but no penalty call. Liam Pecararo grabbed the loose fed and fed Schule below the right circle for an unmarked shot past Oettinger.